Nissan, Ford and Fiat brand saw their European sales decline steeply in March as industrywide registrations fell by 5.2 percent, hit by drops in three of the region's five biggest markets, Germany, the UK, and Italy. 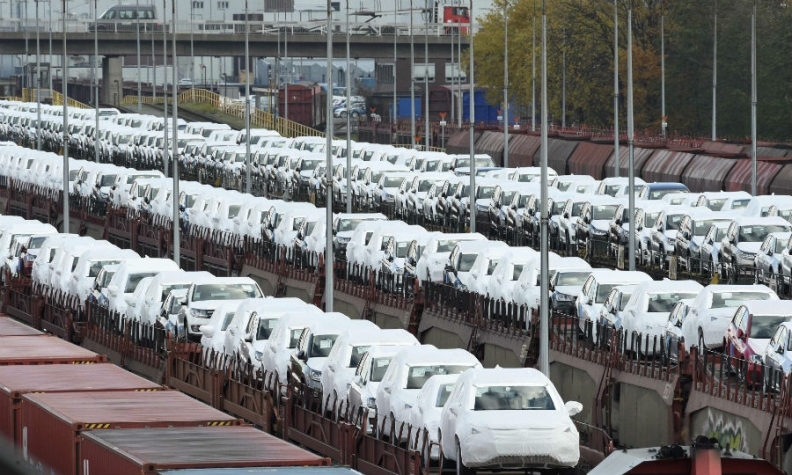 Registrations fell to 1.84 million last month across the EU and EFTA markets, according to data released Wednesday by industry association ACEA. Sales dropped at eight of the 10 top-selling carmaking groups. "Momentum is starting to slow in some markets and especially in the United Kingdom," ACEA said in a statement. Nissan's sales tumbled 16.3 percent last month, with Ford down 14.6 percent and Fiat brand down 13 percent. Volkswagen Group sales were flat with the core VW brand's volume increasing by 1.8 percent, outpaced by 9.3 percent growth at Seat and Skoda's 3.6 percent gain. Audi sales fell 9.3 percent while Porsche's volume was down 11 percent. PSA Group recorded a 1.4 percent gain for its Peugeot unit and a 3.7 percent decline for Citroen. Sales of its newly acquired Opel/Vauxhall brands dropped to 109,733 from 130,462 in March last year. Renault Group sales fell 3.2 percent with Renault brand down 7.5 percent and Dacia gaining 11 percent. Renault's new Alpine sports car brand sold 37 vehicles in March. Toyota brand sales fell 6.3 percent while Asian rivals Kia and Hyundai gained 4.5 percent and 3.3 percent respectively. BMW brand was down 6.6 percent, faring worse than Mercedes-Benz whose volume slipped 1.8 percent. UK sales plunged by 16 percent in March as consumers' apprehension over Brexit and a slump in diesel sales eroded demand. An increase in vehicle taxes that took effect in April 2017 also led to a spate of purchases last March. The German market was down 3.4 percent as a decline in diesel-car sales accelerated after a court ruled that cities can ban vehicles to tackle pollution. In Italy registrations dropped by 5.8 percent, partly hit by customers postponing purchases as politicians negotiated to form a new government following recent elections. First-quarter EU and EFTA registrations edged up 0.6 percent, the slowest gain since the second quarter of 2013, when the region was in the throes of a recession.